The objects you love may have more than sentimental value. Here’s a way to save their past for the future by providing provenance and sharing memories. We sow and we reap, and reap and reap. And then, at last—for most of us—it’s enough already. As nest-builders and home-makers who have bought, polished, collected and protected the furnishings and gewgaws that decorate our lives, it eventually becomes time to lighten the load…unless, of course, we keep making room for more by snagging the adjacent penthouse, restoring the country place, or investing in a Paris pied à terre. But most of us already have our hands too full. And the question is: what do we do with the overflowing bookshelves, the cupboards full of Granny’s dishes, the paintings and prints that meant so much when we bought them early on, the chairs that need re-caning, the lamps that prefer old-fangled bulbs? Divest! say some. Let the kids deal with it! say others. I don’t know where to begin! say even more. My sister, Carol, has been weeding some of her harvest in a casual manner for the past few years—through neighborhood tag sales, school auctions, Goodwill, good causes. But the rest of it, the things that matter most, now have another way to go. Because she intends to leave everything to her sons and their families to sell or keep, she has decided to leave them more than just the stuff. She wants them to know what the stuff is. So she’s come up with a swell solution that appeals to the researcher and sentimentalist in her. And in me. She has started an illustrated inventory of her significant possessions, room by room. In order to provide their provenance, she has been photographing, investigating, and describing scores of objects old and new, big and small, providing facts and prices where she can (wisely, she has saved many receipts). When finished, this catalogue will be a wonderful gift to her kids for future reference. In the meantime, it’s a pleasing diversion from her career as a writer and speaker on the subject of children with sensory problems. I’m really interested in it, so this is a wonderful gift to me, too. 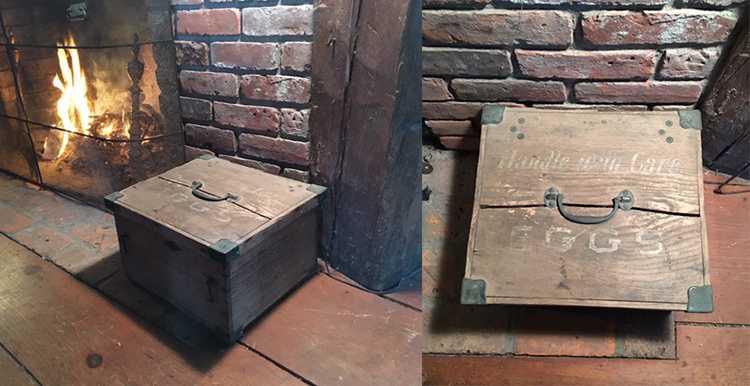 The item that first sent her on this merry task was a decorative eighteenth-century tin toleware document box (above)—lunch-box size—wearing on its back the name of its owner, one Isaac Chidsey. Research took her to the Chidsey family tree, planted in New Haven, and she climbed every branch of it to reveal a line of Isaacs, Ebenezers and Priscillas for at least a century. Cherrywood hutch (above left) with tambour doors and slanted writing surface. Could be 18th-century. Mom and I went to a big New Haven estate sale on Whitney Avenue, c. 1955. $60. Dollhouse (above right), two stories with staircase, hand-built c. 1940 for the owner of The Dollhouse, a New Haven Shop. We were steady customers, so when she went out of business in 1955, she sold it to us for $50, and threw in the four-poster bed, hutch made from a cigar box, and ceiling fixtures. I received other pieces for birthdays, Confirmation, good report cards. 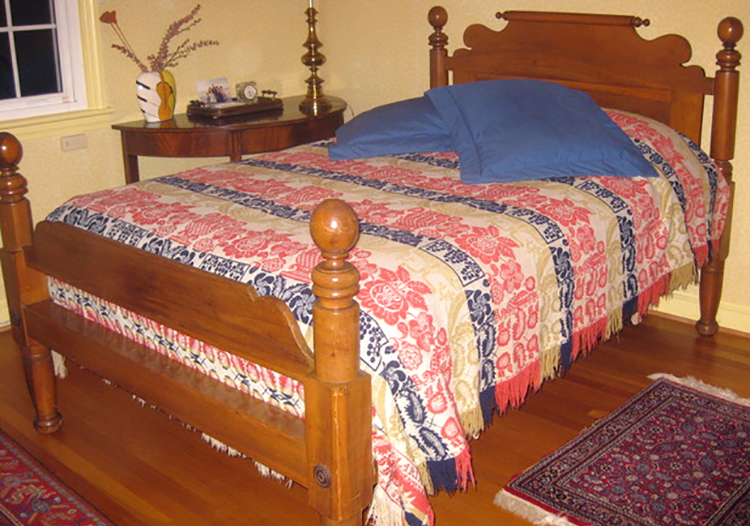 Baluchi carpet, 32″ x 64″. Bought from vendor at Bethesda Women’s Farm Cooperative Market, 2007. $175. Duncan Phyfe dining table with four leaves. Reproduction, probably 1930s. Made in Hagerstown, Md., bought in Olney, Md., 2014. $2,200. Seats 12 with all leaves in. Four-poster bed (above), pine and poplar, 1820, originally a rope bed. Belonged to Nana and then Uncle Bob, who converted it to hold a box spring, which you must keep because it is a custom fit (double size). Insurance appraisal: $1,200. Biederwand (above) coverlet of red, navy, and yellow on cream ground with grapes and fruits, urns, leaves, and feathers. Loomed c. 1830-1840, probably in Ohio or Pennsylvania, by a German weaver for Maria M. Sell (not woven by her, because few women were weavers, and the expert I asked is unfamiliar with her name). Bought at Gettysburg Outdoor Antiques Show, 2000. $250. Invalid feeders (below, aka baby pap boats): porcelain, pewter, plain white and decorated. 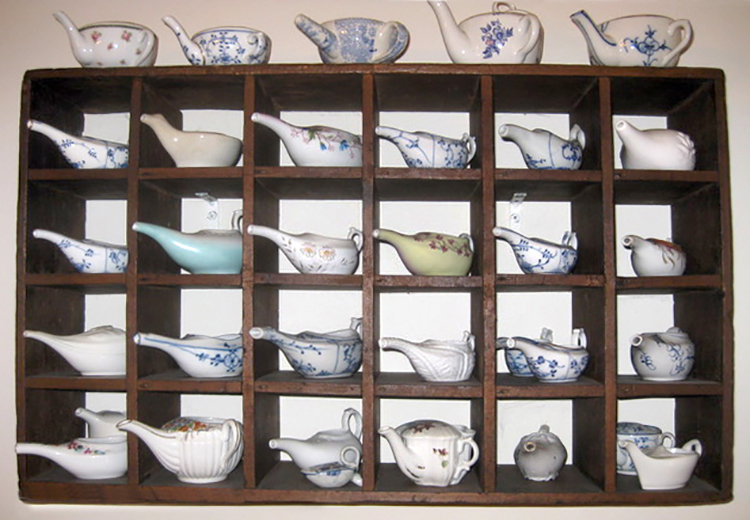 Mom began this collection of antique vessels in the 1950s when they cost $2 and $3 each. In 1984, I wrote an article about them for Colonial Homes magazine. Lace tablecloth (below). At my wedding, this family heirloom lay under the silver and napkins bundled in blue ribbons. When Dad sold the house, the tablecloth went to auction. Aunt Rose couldn’t bear to lose it and bought it back. Years later, when J was about to have his Bar Mitzvah, I got the tablecloth in the mail. Didn’t even know it was still around. Rose just knew I needed it. She insured the package for $500. Mailbox (below): half a burl wood bowl mounted on a round burl slab, was our mailbox on the front porch in New Haven and holds my mail today. Stoneware crock, German, c. 1850. Bought in 1997. $150. It holds two round-handled walking sticks that belonged to Great-Gramps, who had a reputation as an energetic walker in downtown New Haven. The sticks are decorated with hand-painted fjord scenes and the words “Norge” and “Nordkapp” (North Cape, Norway). Swan, hand-carved wood, painted white. Bought in Great Barrington, 2002. $250. Violins: kitschy accumulation of colored-glass bottles, violin-shaped music box, ashtray, pin cushion, pitcher, and yellow wax candle (although I’m a cellist). Pine box. Bought in Great Barrington, 2006. $200. About 9″-by-15″ with handle on cover and latch to close it. Painted on top: “Handle with Care. EGGS”. On one side: “A. Iselin Jr. 711 Fifth Ave. N. Y. City.” Adrian—of the very prominent Iselins—was born in New York City in 1846. He was a Wall Street banker, trustee, and director of such concerns as Cowanshannock Coal & Coke, Lackawanna Steel, Punxsutawney Iron, Bank of New York, and Buffalo, Rochester & Pittsburgh Railway; a member of such clubs as Turf and Field, Riding, Knickerbocker, Union, Century, Metropolitan, New York Yacht, and Tuxedo. Mother, Eleanora, was painted by Sargent. Father, Adrian, was a merchant, banker, financier, and investor in Madison Square Garden and the Metropolitan Opera. Adrian Jr.’s chickens produced such valuable eggs that this was their mode of transportation from his New Rochelle retreat to town. Note: Not only did I inadvertently choose a box as my first item to catalogue, as my sister had, but it led to an even better coincidence: It turns out that Adrian’s wife was the granddaughter of Archibald Gracie, the shipping merchant whose country house eventually became Gracie Mansion, the home of New York City’s mayors—about which I had just written a book! Ellen Stern is the author of Gracie Mansion: A Celebration of New York City’s Mayoral Residence and other books. Carol Stock Kranowitz, her sister, is the author of The Out-of-Sync Child and other books in the Sync series. You may also enjoy Clearing Out Your Parents’ Home by Claire Berman. And Murphy the Schnauzer and Me by Ellen Stern.